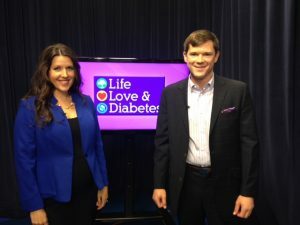 Life, Love & Diabetes is a television program about diabetes management. Rhodes and Alana co-produce the program, which is directed and taped in studio by the professionals at WTVR CBS 6 in Richmond, Virginia. In each half-an-hour episode Rhodes conveys specific tips he has learned in more than thirty years of diabetes management. Alana shares with viewers what she has learned during more than ten years of supporting diabetes management. The couple always interviews an expert during one segment of the program. Two additional segments are dedicated to answering questions submitted by video through this site from Diabetes Support Group Members. To submit a video for consideration for the show, please click here. The first episode of the program was televised in Central Virginia on a CBS cable channel, and is now available to watch here.